When buying an engagement ring, there’s a lot to consider, possibly enough to overshadow the romantic joys underlying the purchase. In order to prevent clouds from covering the sunshine, being prepared for this milestone purchase can significantly ease the stress and lead the way to a better buying experience. Where to begin? First and foremost in most consumers’ minds, a beautiful diamond, or alternative gemstone, must be selected as the physical and symbolic center of an engagement ring. However, that stone, while special, becomes even more so when stylishly showcased to further accentuate its beauty. That is where the art of the setting, and Ritani design, comes in. Ritani is a New York designer and manufacturer of engagement rings, established in 1999. Their settings are sensational. Therefore, whether one is able to afford a .5 carat weight stone for the center piece, or a 3 carat weight size, undoubtedly the clarity, color, and cut of any diamond will be displayed to its utmost. In fact, what may set Ritani apart from other fine jewelry manufacturers is the extraordinary detail brought to each and every design. Drawing from nature, romance, architecture, and art, these masterpiece settings, awash with such touches as sparkling pave diamonds, intricate metal scrollwork, or perfectly placed baguettes, await the personally chosen center stone to complete them. Each Ritani collection offers several styles bound by a central design theme. With some more intricate than others, there are price variations within every collection, dependent upon total carat weights of diamonds already a part of each setting and band. While metal choices include 18k white, yellow, or rose, gold, as well as platinum, there are specifications as to what size center diamond/gemstone should be accommodated by the ring, most ranging from .5-2 ct. Rings are mostly designed as semi-mounts, the stated prices on Ritani’s website (listed below) not reflecting the final price, as determined by center stone selections. Nonetheless, these rings are so breathtakingly beautiful, it is easily imaginable that they will provide a stunning backdrop for that final stone. Endless Love: A one of a kind collection, featuring micro-pave diamonds and ranging from $2200-$6600 for a single, center stone accommodating design, and up to $11,000, for a three-center-stone accommodation. This collection is one of the few that is factory designed and sold with either complete or semi-mount choices. Ritani Setting: Featuring solitaires, this is one of the most sought after style collections today, with prices ranging up to about $6500 for semi-mounts. What sets them apart are invisible prongs, discreetly enhanced by tiny diamonds that are sometimes heart-tipped. Romantique: Architecturally inspired, this collection offers vintage styling evident in hand carved Grecian leaves on the shanks, with optional raised beaded edging. Priced from $3200-6700, rings await the finishing stone. Floral by Ritani: Micro-pave petals support each center stone, diamond encrusted and blossoming just like love. Very feminine and pretty, not to mention unique, most semi-mounts begin at about $2500, topping out around $5,000. Anadare’: This collection builds on the theme of two hearts meeting, entwining to become one, and features, accordingly, a twisted shank of glittering paves. Semi-mounts range from $1700-$4,000. Bella Vita: With a name meaning “Beautiful Life,” this collection is similar to Endless Love because of the micro-pave features throughout. 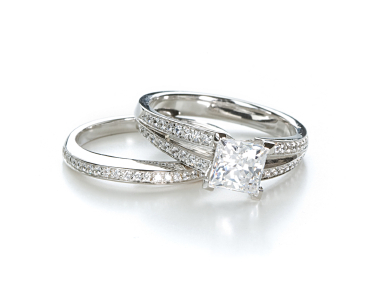 With an emphasis on reduced metal around the diamonds, a stunning view is achieved from every angle. The tapered side-stone baguettes and double row diamond shanks lend heightened interest to some designs. Costs range from about $1700-$5800. Masterwork: This collection is designed to accommodate at least a one carat center stone, and some designs feature a “cushion halo” of diamonds to surround it. The price range is amongst the highest for semi-mounts, due to the extent of diamond usage throughout and a stand alone, work of art appearance. Expect a price tag beginning around $3675, going up to $12,000 for a mount accommodating 2 carats or larger. Truly unique, befitting an artistic bride, some rings are designed with a colored or interestingly shaped center diamond, such as a yellow heart, or with eye-popping blue sapphire side stones. Modern: As with the other collections, these designs can accommodate many center stone cuts, including princess, round, and oval. They are priced, as semi-mounts, from about $2300-$6300, depending on how the decorative setting diamonds are displayed and married with the metal framework. Classic: For those valuing the traditional look, yet wanting fresh designer concepts, this collection offers a range from $2100-$4900, with each style awaiting the perfect center piece. With the Ritani collections, there’s the distinct advantage of a gorgeous setting, allowing a center stone to fit one’s budget without sacrificing style and craftsmanship. However, for many, budget conscious or not, it’s about more than a single stone, importance also being attached to overall appearance of the ring and how it graces the finger. With Ritani’s attentiveness to design detail, that part of the quest is well satisfied. When wondering about getting the best diamond deal, though, it’s often said that with diamonds, there really are no best price deals. In fact, if one diamond seems the same as another but is priced lower, it is for the reason of reduced quality, nothing less. How to be assured of getting the best quality? While best price deals may be an illusion, best quality deals can only be obtained from the best dealers. The best dealers are the most knowledgeable, reputable and honest; and only honest dealers will accurately represent a diamond’s quality. Without proper grading and assessment of a stone’s beauty, one may easily pay more for less quality. Proper diamond grading certification, by a third party is, therefore, recommended, as well. Along with local jewelers, there are some reputable internet sites for jewelry and gemstone shopping that can be used as a benchmark for making comparisons. However, nothing takes the place of getting educated on the characteristics of a well-chosen diamond, then seeing them up close and personal to make the final selection. Sizing should not be a problem, so long as another ring belonging to the future bride can be secretly used to measure against a jeweler’s ring sizing tool. Make sure the comparison ring is one that fits currently, not one worn long in the past, though. When planning a surprise, however, pleasing the recipient of an engagement ring can be tricky. How to be sure she will like it? It is advisable that would-be fiances try to ascertain their girlfriends’ preferences, in advance, perhaps when window shopping or internet surfing; shape of the main stone, type of metal, and fanciness of design, including additional adornment and setting style, should all be considered. Even the band offers choices, with some being split, others very wide and diamond covered. Knowing what someone likes is much more important if it’s a surprise rather than a mutual selection and will alleviate the stress of choosing. Where to Buy Ritani Rings? Ritani rings may not be purchased directly from the manufacturer, but only from authorized dealers throughout all fifty states, the District of Columbia, and Puerto Rico. These dealers can also provide final pricing based on center stone selection. While there are some reputable internet sites for purchasing diamonds and diamond engagement rings, and some of the local jewelers listed on the Ritani website also offer online purchasing, this type of once in a lifetime purchase would seem best served by visiting the store itself. That is probably most fitting, as this kind of design uniqueness can only be experienced by firsthand shopping. Should a visit to a Ritani store not provide the particular ring one is looking for, the sales associate can contact Ritani, in New York, to answer any further questions. Also, while a dealer may not have every design in stock, they will have a dealer’s comprehensive catalog which may be perused for all available styles. Additionally, Ritani’s website is constantly being updated and is an excellent place for browsing when one is interested in becoming educated about engagement ring settings. Besides all of that, Ritani will also entertain custom designs should one have needs not otherwise met through the existing styles. They will actually consider customization to create the engagement ring of someone’s dreams. While that may or may not offer a chance to surprise a bride who wants to be involved in the design, it is a wonderful thought to consider and only makes Ritani more outstanding as a manufacturer with an eye for design and an ear to customer service. It is no doubt this company goes beyond cut, clarity, and color in the diamonds they so knowledgeably use to create their timeless masterpieces.